Coat the fish fillets lightly with seasoned flour. Heat the olive oil in a frying pan and fry the fillets. Remove to a serving plate to cool. In a non-stick pan over medium heat lightly caramelise the onions, add the garlic, peppercorns and herbs. Pour in the wine and vinegar and cook for two minutes. Add the sugar and raisins and taste for a pleasant balance of flavour between sweet and savoury. Pour over fish, cover and allow to marinade for several hours or overnight. Enjoy FREE Freight and guaranteed delivery when you join our new Virginia Vineyards Unlabelled Club. If you love our great value every day drinking unlabelled wines and want to ensure you never miss out again click here to find out more - join today! This simple starter for four or light meal for two by Peter Howard was kindly shared with us by our friends at Selector Magazine. 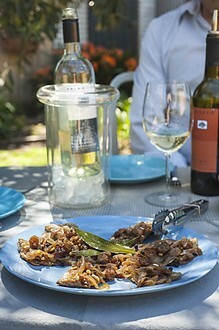 For more great receipe suggestions from Selector just click here. Cook the prawns then tumble them together with the orange juice and mint leaves. Leave to marinade for 20 minutes. For the salsa: mix the zest, diced orange segments, chilli, tabasco, sugar and JOSEPH Extra Virgin Olive Oil together and allow to sit for 10 minutes. Spread the chopped Cos lettuce on a serving plate, spoon on the salsa and top with the prawn, mint and orange juice mixture. Sprinkle the cashew nuts evenly over the dish and serve immediately with an accompanying glass of JOSEPH d'Elena Pinot Grigio. This 2013 disgorgement too is a high achiever, the final wine as complex and complete as you could ask for, with a little dose of nearly everything. We hope you enjoyed a bottle of this very special fizz over the festive period!